Box of finest Walters Nougat in handy 50g size. Made with the finest quality natural ingredients, a treat to enjoy at anytme, box contains 5 of the following bars ... Cranberry & Almond, Ginger & Almond, Almond, and Macadamia. 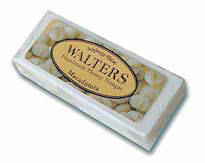 More about Walters Nougat... made with 36% premium roasted nuts, 10% selected first grade honey, 9% egg white. No Cholesterol, no gelatin, no preservatives, no artificial colorants or flavorings. About Walters Nougat; Walters Nougat is now available in the UK, at The Cheese and Wine Shop, which means you can get your favourite Nougat tomorrow. Sink your teeth into 36% premium roasted nuts and 10% selected honey …. delicious with your morning cup of coffee or as a desert with your favourite wine…. in fact it is great at any time of the day and works perfectly as a wholesome energy booster. Made with the finest quality natural ingredients and bring them together using lots of time and care. No gelatine, no preservatives, no artificial colours, no large nougat making machines, no short-cuts…… just good honest wholesome food the old fashioned way.